Yes, you should worry… but there are solutions out there for you. Please don’t dismiss the legal change as another bureaucratic annoyance. This problem won’t go away on its own. In the next months, if millions of websites do not meet a slew of complex and new accessibility requirements, they will be in very real trouble. New rules related to the ADA’s regulations on website compliance, already enforced on airlines, health-related sites and others services, will be issued in January 2018. And violators of already existing guidelines — such as earlier ADA regulations, Web Content Accessibility Guidelines and Section 508 — will increasingly be sanctioned. These rules and regulations affect all state, federal and municipal agencies – but, importantly, they affect many businesses, too. If your web operation falls under new laws and Americans with Disabilities Act regulations about to come into effect — and you fail to comply early — your business could suffer. Section 508, one law that you might have heard of, requires that federal agencies make their information technology accessible to everyone. Federal employees with disabilities must be able to work on adapted and accessible computers, phones and office equipment. They must be equipped with technological solutions to take on-line training or access online work servers and sites to locate needed information, as any other employees would. Section 508 also means that people with disabilities who visit any federal websites must have access to the same online resources and content as anyone not suffering from a disability. But you could be on the hook even if your business doesn’t come under 508’s purview. That’s right; the Americans with Disabilities Act requires that commercial entities that have “places of public accommodation” — which includes a presence on the internet –don’t inadvertently discriminate against people with disabilities. That means their sites must make text, audio and video content available in other forms so that people with disabilities can benefit from the same information. 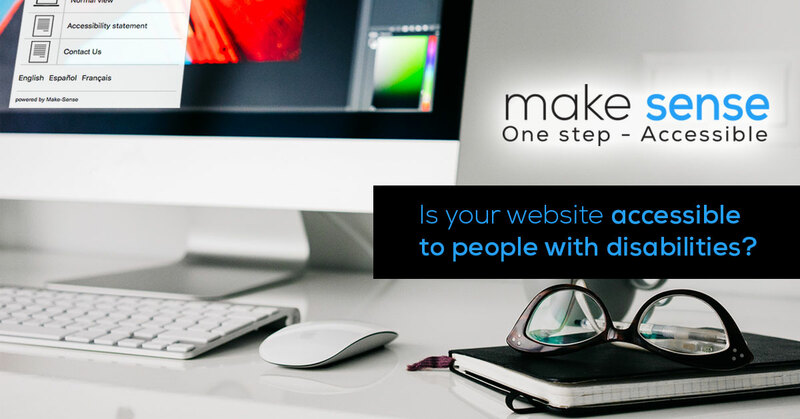 Just as numerous buildings are required by law to have wheelchair accessible ramps and other facilities to ensure that people with disabilities are not effectively excluded, so too must websites. But it’s not quite that easy to ensure accessibility to all in the online realm. Do you know, for example, if your video is likely to cause seizures? Is it easy for users to separate foreground from background in your pictures? Is your text sufficiently readable? And what about even less straightforward requirements: is your site sufficiently understandable? Do your web pages appear to operate in predictable ways? Businesses who must meet these and other not so self-evident standards of compliance are those with 15 employees or more, businesses operating for the benefit of the public and all government agencies. Does your business fall under one of these broad categories? Chances are that it does. Despite the new rules – not to mention the serious ramifications of failing to abide by those rules — most businesses have not yet taken any action. In fact, according to GCA Magazine, a staggering “87 percent… of the 435 municipal and county government respondents said they have moderate, weak or no knowledge of federal web accessibility requirement.” Overall, GCA’s 2017 survey revealed that many local government leaders and IT professionals are still struggling to come to terms with laws that are 20 years old in some cases, are failing to meet requirements of the new laws and regulations. They face many complex technological obstacles that prevent their websites from being upgraded to accessibility standards, or from being as effective, transparent and accessible as the law demands. And while this survey covers government agencies’ accessibility shortcomings, businesses are not so different. As a business’ webmaster, you must think of accessibility solutions, you must do so now, and you must do so in an intelligent way. It’s your job. And there are no patchwork solutions, because the law also requires that your web accessibility technology be compatible with current and future assistive technologies. Do you have time to wade through all of the regulatory mish mash and match its ins and outs to your intricate tech? The good news is that some companies had the forethought to develop solutions that make webmasters’ lives easier. As Make-Sense CEO, David Adi, puts it, “it’s essential for webmasters to know the WCAG 2.0+ guidelines; they’re the basics, but 99% of webmasters out there are busy developing their technology and have no time for what they see as a needless annoyance.” According to David, “they can’t be expected to invest the time and resource to tailor make solutions that allow their business to meet new rules.” That’s why, he says, his company has developed, “a one-stop solution that identifies any site’s accessibility failures and provides immediate fixes.” And think of it, solving your accessibility woes won’t just put you in good standing with the law, it could increase your traffic by 18% or more, and improve your Google search rank, to boot. So, while webmasters need to take this change seriously – and yes, worry if they have been remiss – there are very convenient fixes out there that meet the requirements of the law without slowing down your technology. It’s your job to look into them and find the fix that’s a good fit, before it’s too late and you are in breach. But act fast, the change is coming. Learn more on Make-Sense web accessibility solutions suite.